When your business is finally starting to pick up and customers are ordering like crazy, relying on an old inkjet and a pair of scissors to make mailing addresses just isn’t an option anymore. Even if you’ve only got a pantry to reorganize and need a way to tell apart pickles from prunes, the best thing to do is to get a reliable label printer! 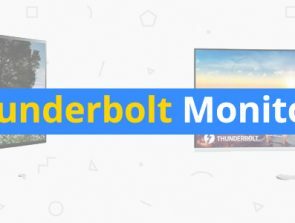 In this guide, we take a look at the best label printers that you can buy in 2019. Max label width 0.5 in. Live label preview and power-saving feature. Max label width 2.4 in. Quickly produces labels and supports two-color tape. Max label width 1 in. Great mobility. Can print up to 7 lines of text. 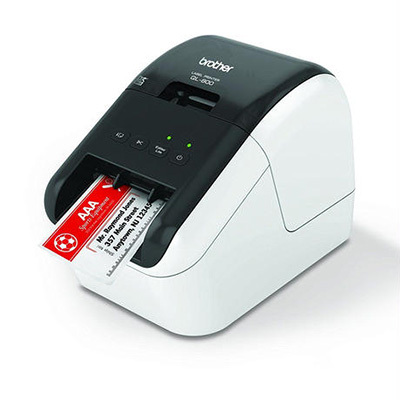 Label printers are compact and handy devices that use special cartridges or cassettes. Rather than relying on ink which can dry out or leave unseemly blotches, label printers use heat to precisely mark only the part of the tape that corresponds to your design. Best of all, they print in a handful of smaller formats ideal for producing barcodes, labeling folders, or creating durable shipping addresses. The market isn’t exactly overflowing with label printer models and is dominated by a few well-known brands. Even so, there are those that stand out, and we’re taking a closer look at six of them. Whether you need a good printer for occasional use at home or can’t function without one at the office / job site, the selection we’ve put together is sure to cover all your labeling needs. 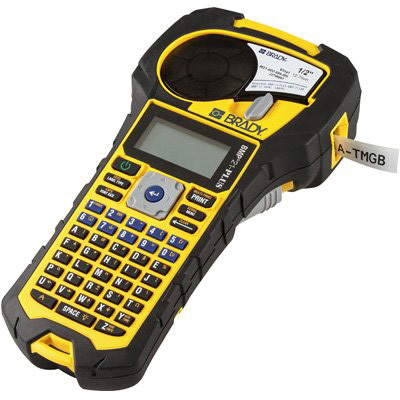 You’ll see us talking about Brother’s excellent line of label printers a lot in this article. Even though it seems like they’ve managed to come up with a model for every occasion and environment, they really outdid themselves with the PT D600! Portable, versatile, and capable of producing top-quality prints, it’s our go-to label printing solution, and here’s why it should be yours too. When designing the PT D600, Brother wanted to make absolutely sure that you can use it anywhere on its own. It has a fully functional QWERTY keyboard that’s very responsive to the touch, and a color LCD screen which lets you see exactly how your labels will turn out without needing to be hooked up to a computer. 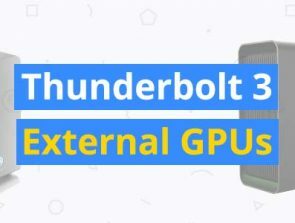 Best of all, it is powered by either an AC adapter or through 6 AA batteries, so even if you’re in a large warehouse with no outlets nearby, you can take full advantage of it. Labels are created with Brother’s proprietary TZe tapes, which you can get in a variety of dual color options The tapes are laminated and depending on the material they’re made from can even be ironed onto clothing. The printer supports a number of different widths, 1 inch being the widest. This is big enough for seven lines of text to be printed at once. 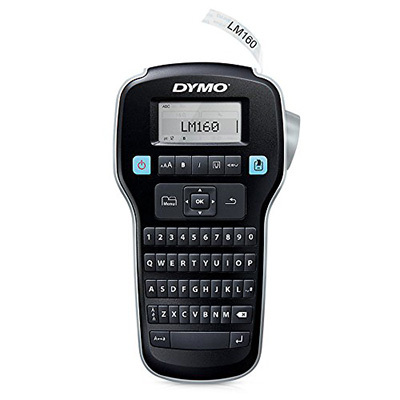 Using the PT D600 to design and print labels is simple – the LCD display lets you see what the end result will look like as you type, and customizing the label by adding different border styles or symbols can be done on the spot as well. There are 14 fonts and 8 sizes to use, making each print you design unique. Hooking the printer up to a PC or Mac allows you to design labels even quicker with the editor and store popular designs for later use. By far the biggest issue you’ll run into when using the PT D600 is its tape-wasting print method. Every time you start to print a label, a 1-inch long strip of tape will be wasted before the actual label is made. This can end up costing you a lot on tape replacement in the long run. When using the built-in keyboard, you have to press both the print and OK buttons to start a printing job. It would be quicker if you could just hit print and be done with it. Dimensions: 7.9 x 7.6 x 3.4 in. Maximum label width: 1 in. For an office environment which depends on shipping to stay in business, a quick and reliable label printer is one of the most essential tools. 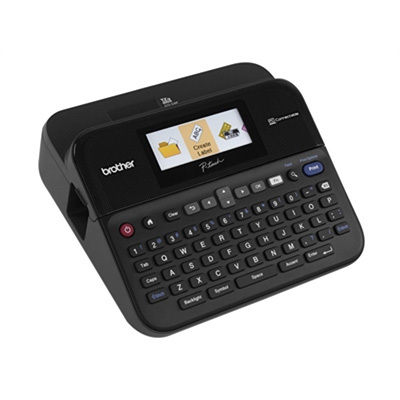 Brother knows this, and apart from versatile models like the one reviewed above, they offer professional label printers like the QL-800 which churn out clean, legible prints with astonishing speed. If volume and quality are more important to you than frills and customization, look no further. You’ll find that the QL-800 is highly utilitarian – there are no keyboards or screens to make use of, just its elegant housing, four buttons, and two status lights. It works by connecting either to your computer or smartphone, producing as many as 93 standard-sized shipping labels per minute, more than enough to accommodate any small to mid-sized business. Pressing its “Editor Lite” button will boot up the built-in editing software on any computer. This gives you a barebones environment in which to design professional-looking prints. The model is also compatible with the excellent P-Touch editor which introduces more fonts, designs, and other options. From one-line barcodes to shipping addresses taking up the maximum label width, prints are detailed and easy to read. Even pictures or postage stamps are great quality at the printer’s highest resolution. Two-color paper is another interesting feature – Brother sells 2.4-inch wide tape that prints in either red or black, or both! With it, you can create labels that unmistakably warn whoever handles a package about the fragile things inside, and it can add a little color to an otherwise stale monochrome design. Tape refills don’t come with their own spool, so you’ll have to use the one you got with the printer each time or get extras. This doesn’t sound like that big of a deal if you use the same-sized tape all the time, but if you need to switch from one size to another frequently, it can be annoying. We also hope that Brother will consider offering the red & black tape in a smaller size in the future. Dimensions: 4.9 x 5.6 x 8.4 in. Maximum label width: 2.4 in. When you’re undertaking the monumental task of organizing your attic or work in a company’s shipping department, you can’t rely on outlets or computers to keep the labeling going. 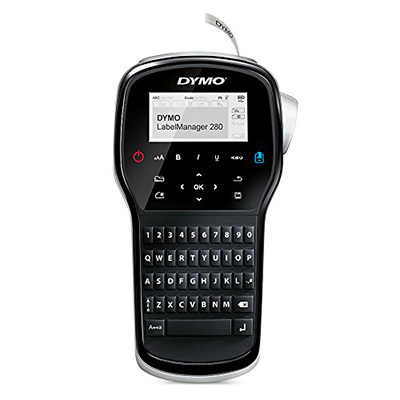 DYMO’s elegant solution to labeling efficiency is the LabelManager 280, a printer powered by rechargeable batteries you can work within any environment. One look at this printer’s design is enough to tell you that it’s meant to be used in a dynamic way. The lower part houses its keyboard and is narrower than the upper one where the screen and controls are, making it easier to hold onto the label printer with one hand and type away with the other. The keys are small but nicely spaced, and there’s even a number row so you can type addresses or inventory entries more easily. On its own, the LabelManager 280 provides a basic set of customization options. You get six fonts to play with as well as eight box styles and over two hundred symbols. The layout is visible on the built-in screen and changes as you add or edit the label, leaving no room for error. If you connect the LabelManager to a computer, you also gain access to that computer’s font library and can potentially unlock an unlimited number of designs. All of this would be of little use if the printer had to be tethered to one place or at the mercy of ordinary batteries. In an ingenious move, DYMO has opted to use rechargeable batteries instead. You’ll use up more than a full cassette’s worth of tape before needing to recharge, making the LabelManager 280 quite cost-effective. 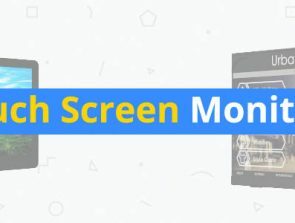 The screen lacks a backlight, so you’ll need to work in a fairly bright environment to see it properly. While letters and numbers are easy to get to, locating even elementary symbols like commas and exclamation marks requires searching through the symbol menus. Making multiple copies of the same label won’t be affected, but writing different ones with symbols in them may become tiresome. Dimensions: 8 x 2 x4 in. Maximum label width: 0.5 in. So far we’ve mostly discussed label printers that are perfect for work, but what about models tailored more towards creative use? Wouldn’t it be great if moms or teachers had a no-fuss label printer they could hook up to their smart device and start designing right away? It seems that Brother is on top of every eventuality as they have a perfect printer for the casual user too – the P-Touch Cube. 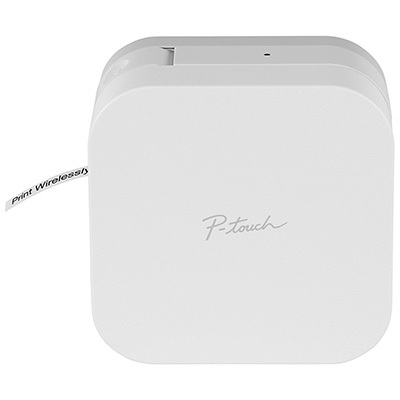 Arguably the most visually appealing of the bunch, the P-Touch Cube is just that – a cube-shaped label printer with minimal interventions to its pleasant design. Its ports and buttons are unobtrusive while the TZe cassette tape and 6 AAA batteries are hidden away. You even get to choose between white and sky blue! Pretty looks don’t mean that its performance is shabby though. While it will never outpace the QL-800, the Cube can printout a label with 2-3 words on it on the widest 0.5-inch tape in less than 10 seconds. Since you’ll be designing each label through a mobile app, producing different prints is more streamlined than that of models with built-in keyboards. The ability to connect to and work with your smart device is the Cube’s biggest asset. Bluetooth recognition is quick and simple, while the app used to shape and print your creations has a lot to offer. You can either choose among themed presets (kitchen, special occasions, storage etc.) or use the library to make your own border and symbol layouts. The app integrates flawlessly with your smartphone’s keyboard, taking full advantage of its built-in spellchecker. Text-to-speech is supported too for maximum convenience. The Cube doesn’t have a USB port, meaning that you can’t connect it to a PC/Mac. The software it comes with is great if you mostly stick to the presets, but limiting when you want to design your own labels with anything more than a single symbol. Lastly, you’ll need to pair your device with the Cube each time you activate it. This can take upwards of half a minute and is annoying if you just want to print straight away. Dimensions: 4.5 x 2.5 x4.5 in. Factories and laboratories call for a label printer that can keep up with rigors and hazards most models are never likely to face. Brady delivers on this! They’re known for creating highly robust and specialized label makers. Both they and the labels that come out of them are designed to last a good while in the toughest conditions. If you’re an engineer that needs clearly-labeled circuits and wires no matter how gritty the job site is, the BM 21 will never disappoint you. Since it’s likely that your work day involves bumping into things and less than careful coworkers, it’s great that Brady has designed their label printer to be so tough. It has rubberized bumper guards that mitigate fall and shock damage, and a manually-operated cutter that holds on to the label. There’s a versatile attachment dock located on its back that houses either a flashlight, a magnet, or a belt strap. The LCD display is backlit and filled with useful information like the battery’s status, whether bold is on or not etc. The keyboard has caps lock and shift functions which toggle capitalization and give you access to general as well as specialized engineering and electrical symbols. If you get the Lab version instead, the printer comes with more symbols used in science and can format the labels to suit test tubes. Monochrome prints in a couple of resolutions are available, the maximum being 180dpi. There’s only one font, but the numbers and letters are all clearly distinguishable. Each label can be serialized and printed along with its own barcode in either Code 39 or 128 formats. The printer has enough internal memory to store 12 different print designs, and a single one can be copied up to 99 times with the choice of continuous or single output. After a time the prints might start to fade and become hard to read if dirt accumulates on the print head. If you print only one line of text, it doesn’t get centered even if you turn on the corresponding setting. Clip-on magnets and batteries are a great idea, but you can only use one or the other. Dimensions: 9.9 x 4.5 x 9.5 in. Maximum label width: 0.75 in. Are you keen on imposing some order on the chaos that is your home or office, but don’t want to spend much money on a label printer? In that case, give DYMO’s LabelManager 160 a shot. It’s the 280’s less versatile little brother, but the appealing price makes missing out on things like more borders and font styles a fair tradeoff. In appearance, the 160 looks very much like the model we’ve reviewed above. There’s the same black & gray plastic housing with its narrow bottom part, a one-line LCD screen you can preview the label on, and a QWERTY keyboard without symbols. The controls are easy to grasp and you’ll likely start printing without consulting the manual. Everything about the LabelManager 160 is geared towards saving you time and money. When cutting, it is much more precise than most of Brother’s models and leaves less wasted tape. The tapes themselves are cheaper to buy, and a refill can last you a while. The printer is powered by AAA batteries and has an auto shut-off function that prevents it from draining them. Font and design options are rather sparse as you can’t connect the printer to a computer, but they will do for most people’s organizational needs. There are six fonts as well as eight styles to accent them with like underlining and text reversal. Two lines can be printed with a maximum font size of 12 each. Apart from the clunky symbol selection we’ve mentioned earlier, the 160 has a tendency to jam when you change cartridges. Printing a short label containing just a letter or two first will fix the problem, but issues like this shouldn’t be present in the first place. Dimensions: 8 x 1.9 x 4.7in. Unless you’re buying a label printer solely for printing information you’re getting off of a computer, make sure it’s one that can always be at arm’s reach. Models with rechargeable batteries are the most portable since they aren’t dependent on a nearby outlet, and are much lighter than ones powered by standard batteries. For ultimate freedom, consider a model that has its own keyboard. Label printer manufacturers produce models with different daily print volumes in mind. You wouldn’t get the LabelManager for an office that sends out tens or hundreds of pieces of physical mail out each day for example. Before settling on one label printer, make sure that it can meet daily demand. 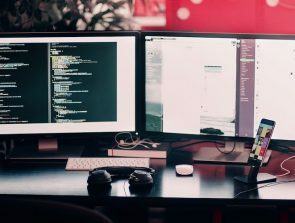 Being able to connect your label printer to a computer or tablet usually brings more benefits, from powerful editing programs to the ability to store your creations for later use. It also eliminates the need for a keyboard, making the device itself smaller and lighter. Label printers can be highly flexible with the print sizes they allow. A few have a set limit of rows per label, others’ capacity is only limited by the smallest resolution. You should get a printer that combines adequately-sized labels with legible letter sizes. Resolution (expressed in dots per inch or dpi) gives you an idea of how detailed the prints will be. Most consumer-grade and small business label printers have a resolution of up to 200dpi, which is enough for a couple lines of text or a barcode. Bigger or more detailed labels require better resolutions, so you’ll find that more advanced models have a resolution of 300dpi or more. A label printer is only as good as the tape you feed it since it contains all of the “ink” which is then heated. You can disregard options that are fancier than black & white if all you need are some folder names, but why not be creative and support a company that has many more color combinations for you to try? The colored labels are usually monochrome too, but getting differently-colored tapes is still a great option for even better coordination. Some printers support foil, plastic or even fabric tapes. You might have found the ideal label printer at a bargain price, but never forget that buying the device itself is just the first of possibly many payments you’ll have to make. The tape that comes with a new purchase is usually much smaller than a regular refill and will be used up really quickly, at which point you have to get one of sometimes dozens of options. Tapes of the same quality and size can vary in price depending on the manufacturer and any special features they might have. The lowest cost per label you’re looking at is about one cent, while special labels like the two-color ones Brother’s QL-600 can use will set you back ten times more. Note that all manufacturers use proprietary refills and that only some of them can be faked with uncertain results.